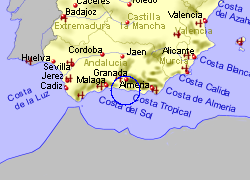 La Herradura, in Granada province, Andalucia, sits behind one of the prettiest bays on the Costa Tropical coastline. 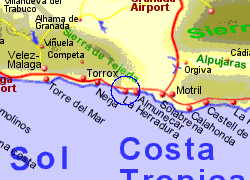 Guarded at each end by two natural promontories, the Punta de la Mona and Cerro Gordo, which provinde shelter, the 2Km long sand and shingle beach is one of the main attractions. The clear waters make it ideal for scuba diving, and the fact that 25 Spanish galeons sank in the bay in the 16th century due to a storm adds extra interest. 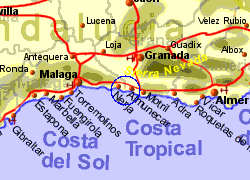 Map of the La Herradura area.